Don't search the globe for renewable and sustainable materials: American hardwoods fit the bill! From alder and cherry, to the oaks and walnut - to name just a few - the American hardwoods have been bringing warmth and beauty to the built environment for centuries. Nearly two dozen abundant species provide plenty of color, grain and pattern. North American hardwood forests offer more choices than any other temperate hardwood forest in the world. 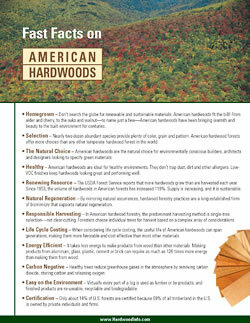 American hardwoods are ideal for healthy environments. They don't trap dust, dirt and other allergens. Low-VOC finishes keep hardwoods looking great and performing well. In American hardwood forestry, the predominant harvesting method is single-tree selection - not clear-cutting. Foresters choose individual trees for harvest based on a complex array of considerations. Only about 14% of U.S. hardwoods are certified because 69% of all the timberland in the U.S. is owned by private individuals and firms.